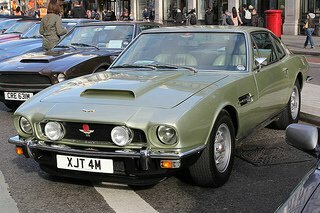 The larger 2+2 DBS sports car was introduced in late 1967 and was intended to the successor of the DB6 even though, for the next three years, the two models would be produced alongside each other. 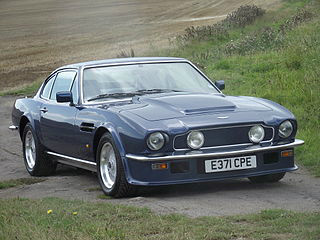 It was powered by the same straight six, 4 litre, Vantage engine as used in the DB6. However, two years later, and following persistent demand from the market, a 5.4 litre, V8 engine replaced the 4 litre unit. The new model was designated the Aston Martin DBS V8 and was identified by its squared-off grille containing four headlights, and was available as a two door coupe and convertible. By 1972, a total of 787 DBS's and 4,021 DBS V8's were produced. 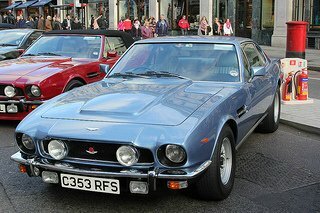 In early 1972, since the six cylinder DBS had been phased out, the DBS V8 was renamed the Aston Martin V8 Series 1 sports car and, together with the Vantage variant, became the flagship model until it was replaced in 1989 the Virage. Between 1972 and mid 1973, the front section was slightly restyled with the addition of a mesh grille and two quartz headlights in place of the original four units, and the replacement of the earlier triple carburettors with Bosch fuel injection. 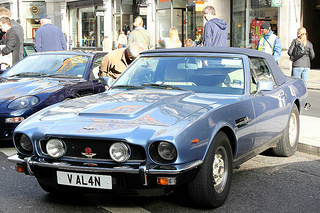 A total of 288 of these Series 2 cars, now referred to as the AM V8 sports car, were finally built. For reasons best known to Aston Martin, the Bosch fuel injection was replaced by four twin choke Weber carburettors in 1973, which required the addition of a larger air scoop on the bonnet to allow for the increased size of this unit. The engine now developed an increased 350 bhp at 5000 rpm, and 400 ft/lbs of torque at 4000 rpm. Fitted with a ZF five speed manual gearbox, and a 9:1 compression, it produced a top speed of 145 mph, with 0-60 mph in 6.2 secs. With the introduction of emission control regulations in the US, output had fallen to 288 bhp by 1976. However, in order to compensate for this huge reduction, a Stage 1 engine was offered in 1977, with modified camshafts and exhaust system, which duly raised output to 305 bhp. Production of the Series 3 ended in late 1978 when 967 units had been built. Introduced in October 1978, this variant was fitted with a rear spoiler, and the distinctive, large air scoop on the bonnet was replace with a barely perceptible power bulge. it was down to 245 bhp. When production ended in 1985, only 352 units of the Series 4 variant were produced. The Series 1 Volante convertible was launched in mid 1978, and weighed 70 kg more than the coupe variant. A total of 656 units were built. In January 1986, this variant featured a return to Bosch fuel injection and the removal of the previously necessary power bulge. When production ended in 1989, 405 coupes and 245 Series 2 Volantes had been built. A typical range of values of a mid 1970's Aston Martin V8 was $35,000/£22,000 for a high mileage example to $120,000/£75,000 for a truly exceptional sports car.